Combine the yeast, sugar and warm water in a large bowl and set aside in a warm place to get frothy. Add the flour and salt and stir in the eggs and butter. You should have a soft, workable dough, but add more flour or warm water if necessary to make a dough you can knead. Knead for about seven minutes and set aside in an oiled bowl covered with a damp cloth. Leave in a warm place for about 1 1/2 to 2 hours, till it seems doubled in bulk. Fold it down, and leave for another 45 minutes. Bring a pot of salted water to boil and drop in the kale. Boil for about five minutes until bright but tender, drain well. Meanwhile, warm the olive oil in a large skillet over medium heat. Add the garlic, red pepper and rosemary, and stir and fry until the garlic starts to brown, probably under a minute. Add the chard and kale, and sautée until the chard is wilted. Add the beans and raisins, and cook to heat everything through. Transfer to a large bowl and add the walnuts and cheeses and a pinch of nutmeg, and season well with salt and pepper. Stir in most of the beaten egg, but leave about 1 T aside. Preheat the oven to 400. Lightly butter a tall-sided tart pan or springform pan. Divide the dough into portions, one about 2/3 the other 1/3. Press the larger part into the pan and up the sides. You should have quite a thin crust, but be sure that you don’t have any holes. Fill the center with the filling. Stretch the 1/3 chunk of dough into a circle, and place over the filling. Seal the edges and fold them over towards the middle. Brush everything with the remainder of the beaten egg. 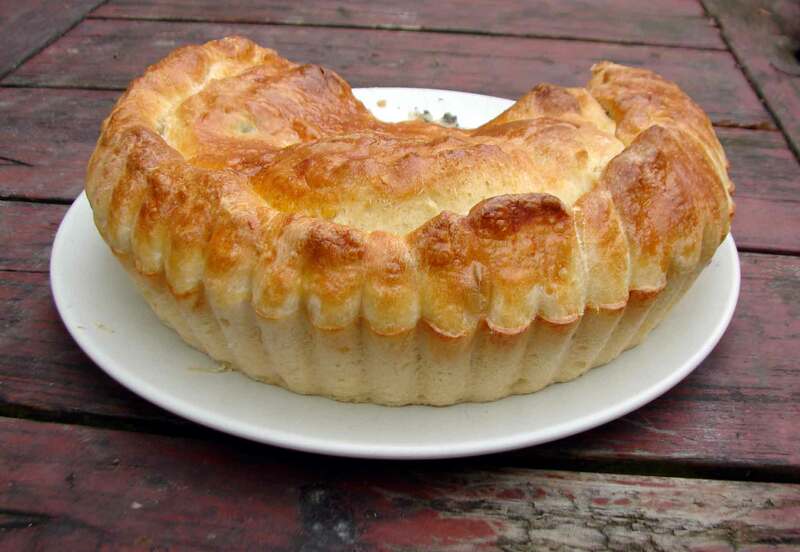 Bake for 30 – 35 minutes, until puffed and golden and firm to the touch. Let cool and set for a few minutes before cutting into it. 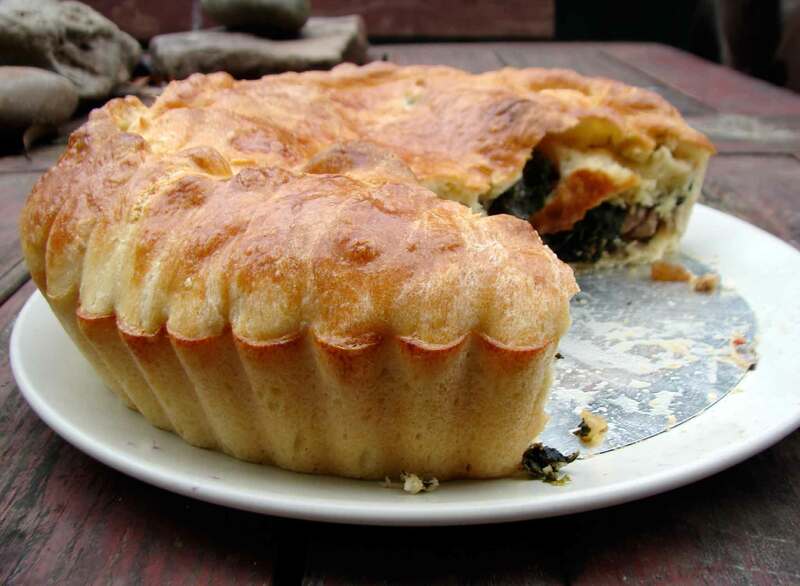 This entry was posted in basic pie filling, beans, crust, pie, recipe and tagged brioche crust, butterbeans, chard pie, greens raisins, kale pie, rich yeasted crust by Claire. Bookmark the permalink. Thanks, TFD! Have a wonderful Thursday!